In the early hours of Sunday, Sept. 9, 1739, 20 enslaved black men gathered near a bridge over the Stono River, southwest of Charles Town (now Charleston), S.C., where they were part of a work gang building a public road. Most of them, including their leader, Jemmy, appear to have been among the 8,000 Kikongo speakers from the Angola region of central Africa brought on slave ships over the previous five years, mainly to work in the rice fields. By the late 1730s, South Carolina, once the most backward colony in the British Empire, had become a dynamic, expanding and profitable plantation society. It was also the first black-majority colony in North America, more closely resembling the Caribbean than New England, the middle colonies or even the smaller-scale slave society of Virginia. By 1739, blacks outnumbered whites 2-to-1 in South Carolina. In pursuit of their own happiness—the significant profits to be made—a small group of white planters drove their black labor force to endure long hours of backbreaking labor in the rice fields. The arduous work of clearing woods and swamps to build roads was grueling, but, significantly, that morning in 1739 the road gang appears to have been poorly guarded. There was no white overseer present, since slaves were sometimes allowed to work for themselves on Sundays. Perhaps a trusted slave—maybe even Jemmy himself—had been left in charge. At any rate, it is Jemmy who is named in the colony’s official report as the Angolan “captain” of what became known as the Stono Rebellion, the bloodiest slave revolt in colonial North America. No other names are mentioned, and his assigned military rank is noteworthy. The report states that, just before dawn, Jemmy led his men from the Stono River bridge to the nearby Hutchinson’s store, where they stole guns and gunpowder and killed and decapitated the two white men occupying the building. Their severed heads were left on the steps of the store, perhaps in retaliation for similar beheadings of runaway slaves, or perhaps as part of a traditional African military ritual. Jemmy then led his men immediately to the house of a man named Godfrey, which they burned down after plundering it for supplies and killing Godfrey, his son and his daughter. Heading south, the rebels reached Wallace’s Tavern at daybreak but did not kill the innkeeper, apparently because he was kind to his slaves. They did, however, kill Wallace’s neighbors and more than 20 other whites and acquired more firearms, gunpowder, provisions and, most important, manpower as they progressed south of the Stono River. By the late afternoon, their number had grown to as many as 100 when they came to rest in a clearing near the Jacksonborough ferry on the Edisto River. The colonial authorities at the time and most historians of Stono believe that Jemmy and his fellow rebels were headed for Fort Mose, in Spanish-controlled Florida, following the path of at least 250 South Carolina slaves, mostly African-born, who had fled there over the previous seven years. During that time, the Spanish offered land and freedom to Kongo slaves seeking sanctuary in Florida, partly to undermine their British colonial rivals in the region, but also because they accepted the Kongolese as fellow Catholics. Like many in Angola since the Portuguese arrival 200 years earlier, Jemmy would have worshipped a combination of Catholicism and older African faiths. Historians now believe that his ability as a military leader and his fellow rebels’ knowledge of pistols and muskets had probably been acquired during the military conflicts that raged in the Kongo in the 1720s and 1730s, and during which he was most likely enslaved. Slaves recently arrived from Africa, in particular, would have been drawn to the advance of Jemmy’s forces by the sound of their drums and the sight of their banners, which resembled those used in Angolan warfare. Even those who were not African-born would have been roused by the rebels who cried out, “Liberty!”—lukango in the Kikongo language. Others could have been emboldened by the apparent ease with which their masters were overcome and by the military expertise of Jemmy’s soldiers and their growing arsenal. Those who joined the rebellion may also have heard the news, reported in Charleston just two days earlier, that Britain and Spain were now at war. If the communication network of the slaves worked as rapidly and efficiently as it often did, perhaps they were persuaded that a heightened British military presence in South Carolina and Georgia would make it much harder to escape to Florida in the coming months. They might also have known of several recent rebellions in the Caribbean, notably in St. John (1733), Antigua (1736) and especially Jamaica, where the British were forced in 1738 to sign a peace treaty with the rebellious African-descended Maroons led by Nanny and Cudjo. The colonial Legislature had already taken precautions to prevent a similar defeat in South Carolina, passing a Security Act in August 1739 that required all white men to carry firearms to church on Sundays. Fearing that “our Negroes … are more dreadfull [sic] to our safety than any Spanish invaders,” the governor doubled the number of slave patrollers and strengthened the militia. These precautions probably spared the planter greater loss of life and property. The authorities were also lucky. Lt. Gov. William Bull, returning to Charles Town on official business, happened to witness the gathering of the rebels but was able to escape without being seen. Bull sounded the alarm to local whites at a nearby Presbyterian church and led a posse of around 100 well-armed men to face Jemmy’s troops at the Edisto River. Although the rebels had traveled only 10 miles from Stono to the Edisto Bridge and were still a long way from Florida, it appears that they had gathered to celebrate their victory and planned to cross the river the following morning. Again, the nature of their celebrations, which involved ceremonial dancing, drinking and feasting, resembled Kongo military traditions. On seeing the militia approach, the rebels ended their celebrations and began firing, but they immediately received a volley of rifle fire that killed 14 of their number. Within a few hours, 30 of the rebels were dead, while 30 or more escaped into the woods. Over the following month, most of those who made their escape were captured, killed and beheaded. It is not known whether Jemmy was among those killed at Edisto Bridge or whether he was one of several slaves who escaped and may have reached sanctuary in Florida. The Stono Rebellion proved to be the most serious and deadly slave revolt in colonial North America. The death toll among whites was not exceeded in a U.S. slave revolt until the Nat Turner slave rebellion in Virginia in 1831. Only in the less bloody (for whites) 1811 German Coast rebellion in Louisiana did a greater number of slaves take up arms in pursuit of their own freedom and happiness. The colonial authorities took swift action to avoid a repeat of Jemmy’s uprising. In 1740, for the first time in South Carolina’s history, the Legislature enacted a rigid slave code to keep potential rebels such as Jemmy “in due subjection and obedience.” This slave code gave slaveholders more power to regulate, control and punish their slaves. It also prohibited slaves from assembling in groups, learning to read, playing drums or even earning their own money. Such measures largely succeeded in preventing further large-scale slave revolts in South Carolina during the colonial period. The events at Stono may also have inspired the foiled 1741 slave conspiracy in New York City. It is significant that most official histories of South Carolina largely erased the Stono Rebellion from the written record. William Gilmore Simms—the leading white intellectual of the antebellum South—briefly mentions it in his History of South Carolina (1860), stating that the leader was Cato, so named by his master after a Roman statesman. Simms incorrectly gives 1740 as the year of the revolt and claims that the rebels “compelled the negroes, however reluctant,” to join Cato/Jemmy. But even Simms’ biased account—which depicted the rebels as drunken and barbarous—was viewed as too dangerous by the white minority in South Carolina, who excluded the Stono events entirely from high school textbooks. The revolt was mentioned, briefly, in mid-20th-century histories by Carter G. Woodson and Herbert Aptheker, but it was not until the 1970s that historian Peter Wood published a full account of the Stono Rebellion. 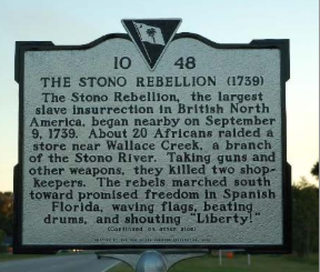 Despite this official silence, however, black South Carolinians kept alive a memory of the Stono Rebellion and celebrated the revolt as a symbol of resistance to slavery for more than two centuries. In 1937 George Cato (pdf), a 50-year-old black laborer in Columbia, S.C., told interviewers for the Works Progress Administration’s Slave Narrative Project that his great-great-grandfather, also named Cato, had been elected by his fellow slaves to lead the Stono uprising. The first Cato was literate, having been taught to read and write by his master, and had written passes for fellow slaves to help them escape. Edited by Henry Louis Gates Jr. and Evelyn Brooks Higginbotham, the African American National Biography was first published by Oxford University Press in an award-winning, eight-volume print edition in 2008; a 12-volume second edition followed in 2012. As of 2015, more than 5,500 separate AANB entries are available online as part of OUP’s African American Studies Center. Steven J. Niven is executive editor of the Dictionary of Caribbean and Afro-Latin American Biography, the Dictionary of African Biography, and the African American National Biography at Harvard University’s Hutchins Center for African and African American Research. He is also the author of Barack Obama: A Pocket Biography of Our 44th President.